I had such fun last week joining in with Meghan’s Week In Review! Lots of great comments and I appreciate them all. It’s always fun at Clean Eats, Fast Feets, whether it’s the Monday Madness of Week In Review or not. I like giving myself credit for what I accomplish. In general, I don’t think we do that enough…we always think we haven’t done anything and certainly never enough. I think Week In Review is good for proving us wrong. –Up early with butterflies in my stomach, I made a phone call for necessary information. Got the info I needed and immediately felt better. Sorry to be cryptic, it’s just something that’s been hanging there for a while and it was my job to take the first step. First step taken, there are more to come but I’m so happy the process is started. –After that, I regained custody of my car that had been at the mechanic’s for several days. Expensive, but it was work that needed to be done. –Road trip to the township where Ralph’s house lives to pay insurance and taxes. Lots of green and looking for wisteria hiding among the trees. Everywhere we turned there were trees engulfed in the wisteria. Beautiful, although I know it damages the trees. Also the first sight of the cocoons that Grandmom always said meant a really hot summer. Guess we’ll see. A yummy lunch but I’m saving that for WIAW!! –Laundry and LOTS of work in the basement. Sorting things to go to the yard sale and finding more treasures. Finding the treasures is the best part of doing all of this sorting out! –Changed the sheets on the bed. Ok, that doesn’t sound like much of an accomplishment, but it is. At least I didn’t tell you about cleaning the bathroom last week…oh, wait…I just did. –A bit of a wild goose chase…annoying and unfortunate, but we’ll keep working at this project. –Lunch at the diner and more laundry when we got home. Not much else accomplished. Funny how when one thing doesn’t work out it sort of puts a damper on your day. On to better things. 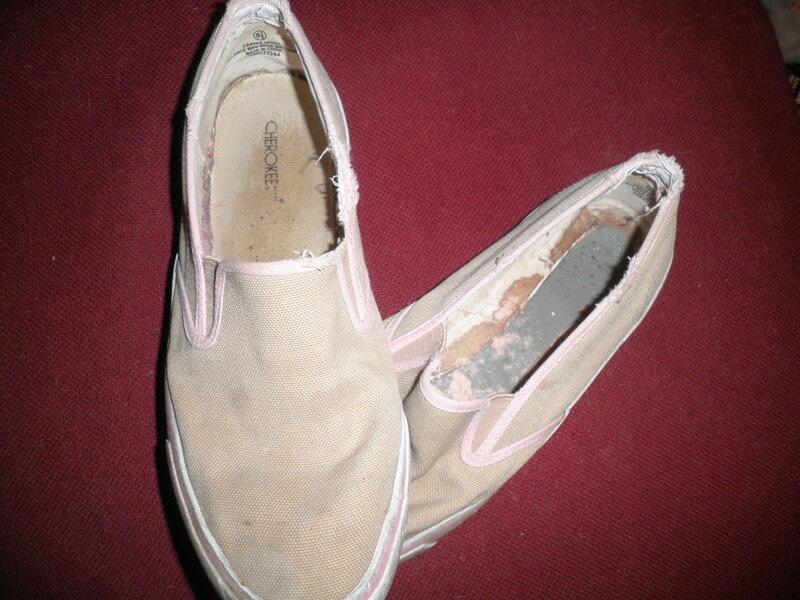 –Sad to say that my pair of knock around the house/ride my exercise bike shoes finally bit the dust. The liner came out of one and I really felt like I was walking on Nothing…I had worn the soles out so badly. They went into the trash. Sorry to see them go. –My visit to Weight Watchers brought me continued happiness. I stayed the same at 13.4 pounds UNDER my goal. I’m pretty happy about it. It was what I thought of as kind of an off week. I don’t really want to lose any more, I’m just really excited that I’m staying right there. –Breakfast out with the Girls after WW and then lunch with Ralph…same restaurant/same booth/same waiter!! Very strange. But I found a new favorite item to order. Saving that for WIAW, too! –I’m sitting here at the computer finishing up my Week In Review! I’m liking this. Coffee at my right hand and the sun is coming out after 2 dreary rainy days. I think this could be a day to enjoy some outside things. –I’m going to a spiritual Gathering this afternoon with Ele, then Ralph and I will be taking her out to dinner for Mother’s Day. I’m really looking forward to both! I’m enjoying participating in WIR. I have to admit though that the only way I can do it is to write it as it happens. Start a post and save it as a draft throughout the week so that I can add to it. I’d never remember ANYTHING otherwise!! Happy Monday! Happy Week In Review! Thanks, Meghan! This entry was posted in Uncategorized and tagged road trips, Week In Review.Weight Watchers. Bookmark the permalink. Wow, you were one accomplished woman last wee Fran, and lots of cleaning in the basement to boot. Great job!! I’m impressed. I hope you had a great time at your Spiritual Gathering and Mother’s Day. Thanks, Meghan! You beat me to it this week! I slept in until 6am. I like doing the post and draft thing. I think it works…only now I have to start again…Yikes! Never fear…I Love It! We had a great time yesterday, thanks! fun to read about your week, fran! i would have to do that, too -> start a draft and add to it each day or else my mind would blank on what i did! glad you and ralph saw ele yesterday – i saw my parents in the the eve. we had snow/sleet/high winds for mday – it is WRONG to have to wear your winter jacket in may!! we have a long weekend this coming weekend, and i hope it is warmer! have a wonderful monday! Glad you got to spend time with Mom and Dad! Not glad about the weather. It was cool and breezy but blue skies yesterday so you can’t complain about that. It was a busy week and hope to keep up the momentum. Have a great day, Cath! Well – everything is an accomplishment…do you make lists and then cross them off for success?? Looking forward to being added to your list tomorrow morning for a get to know you chat…maybe some plans…maybe will let the Universe/synchronicities be the team leader!! WOO HOO!! Looking forward to tomorrow, also! I should make lists more often. Maybe then I wouldn’t be 3 days into the week and say “Dang…I was supposed to do that on Monday!” Starting lists is part of my continual efforts at organization. Letting the Universe lead is a good idea! I hate making phone calls and i always feels so much better when they are done. Looks like you had a great week! Thanks, Alyssa. I feel good when thins are DONE!! Unfortunately, there’s still so much to DO! I’m looking forward to another productive week. I was just thinking I need to wash the bedding today too! So glad for your continued success with your weight loss. You have the knowledge and skills, it’s just about applying it everyday, every meal, or most meals :), right? Thanks, Marie! I keep trying. I’m very lucky that I’ve had this turn around. I’m feeling Really Good!! You washing bedding is Really an accomplishment…more beds and all!! Woah, that sounds like one heck of a productive week! And changing sheets–YES, it definitely is that big of a deal! I always forget just how much time/effort it takes to get everything washed and remade–but mmm, climbing into a fresh bed? Amazing feeling! Allie, you’re so right…nothing like climbing into a fresh bed…which is why I mentioned it! 😉 Have a great day! I hate butterflies in my stomach. Hope whatever you had to be cryptic about went well! I also hate when my shoes come to an end. Normally it is my mother or friends who have to tell me they’re done. I get really hung up on getting rid of clothes/shoes. Don’t like getting rid of anything!! Madison, dealing with state and federal agencies can be a pain. That’s why I put it off for so long. Things are seeming to find their places so I think everything will turn out positively. I’ve had the shoes in the trash can before, and taken them out. They really had become like walking on nothing…the soles were so worn. I was sad. I also have a hard time getting rid of things, which is why I have so many things now to get rid of…Uggggggg…. What a productive week! And well done on staying under your WW goal! It’s a good idea to start a draft of WIR and keep adding to it as the week goes on…I already remembered things I forgot to mention in mine! Liv, I feel better, because I forgot things too! Have a great week! Another amazing week Fran. I’m totally tired out just reading it. Seeing the chiropractor as a field trip. After which you car had to go do it’s chiropractor. Seems to be a certain justice in that. But you forgot to mention that the Bruins beat the Leafs in game seven of the playoff series. Oh, wait; that didn’t happen until this week. Yet another faux pas by the Bear” Grrrr. I’m sure you’ll remind us in a week’s time. Sadly, I’m not much of a hockey fan, but Hooray for the Bruins!! I watch football with Ralph, but even he is not thrilled with the Phila. Eagles in the past few years. My best friend got me into baseball a few years ago, but now I’ve hit a slump along with the Phillies. I’d rather Read!! Have a great day, Bear! Sorry about your shoes!! I have a pair that are only for treadmill use and would hate to have to throw them away. It takes time to get them really comfy! Man you had a busy week.Congrats on staying under your goal weight! That’s great! Thanks, Vicki! I’m really trying and I’m proud of myself. It’s been several weeks and now I can physically feel the loss…I couldn’t before which was strange. Have a great day!